There is absolutely no reason to be compromising when it comes to food on this journey. The kayaks are quite roomy and we supply you with a diverse cooking gear and a large assortment of spices, herbs and flavourings. A nice meal and a couple of cold beers or wine at sunset really makes for an enjoyable trip. Fill out the food order and use our recipes for inspiration. You buy at cost price and we shop and pack it for you, it’s like going to the Swedish supermarket – from home. Make sure to visit our Recipe page. If you find some recipes you like, forward them to your trip mates as a recommendation or print them out to bring with you when paddling. There are also a fair few typical Swedish dishes if you like tasting a little of our culinary culture. All recipes are colour coded to indicate durability recommendation. Dairy such as fresh milk, cream and yoghurt only last a day or two, while crème fraiche (sour cream), soft cheese and hard cheese last longer. Use long-lasting alternatives for milk and cream after your second day. Red: will last maximum 1–2 days. Includes fresh meat, chicken and fish. Orange: will last up to 4 days. Includes smoked and cured meat, chicken and fish, e.g. meatballs, hot dogs, choritzos, bacon, salami, pastrami, smoked ham, smoked turkey, roast beef and smoked salmon. Also includes cheese. Blue: will normally last your whole trip. Includes all vegetables, even though mushrooms, peppers and lettuce look a bit sad after a few days. Green: long-lasting. Anything in a tin or jar, e.g. tuna, anchovy, sardines, mackerel, mussels, crab, crayfish tails, shrimps and beans. It takes some effort to plan meals and snacks for an entire wilderness stay, so why not sit down with your group over a pint and make it a fun pre-kayaking thang. Plan each day’s breakfast, lunch, dinner, beverages & snacks in detail. Free-styling it is a sure way to end up with way too much food. It’s quite a hassle to get stuff out of the kayaks while paddling. Big dinner – when you arrive at your new camp. You don’t have a fridge! Our top quality mylar-lined NRS Cooler bag will keep your food cold for 3-4 nights and is designed for maintaining cleanliness between use. You will receive one 30 Liter bag per double kayak, so make sure to consider space when you order fresh items. Long-lasting alternatives for milk, cream and butter are available. Note! If you’re group is using single kayaks only there is not enough space for the NRS Cooler bag, you will receive a regular cooler bag that will stay cold for 1-2 nights. Please plan accordingly. Our double kayaks have lots of room. If you’re using a single kayak you do have to take space into account. 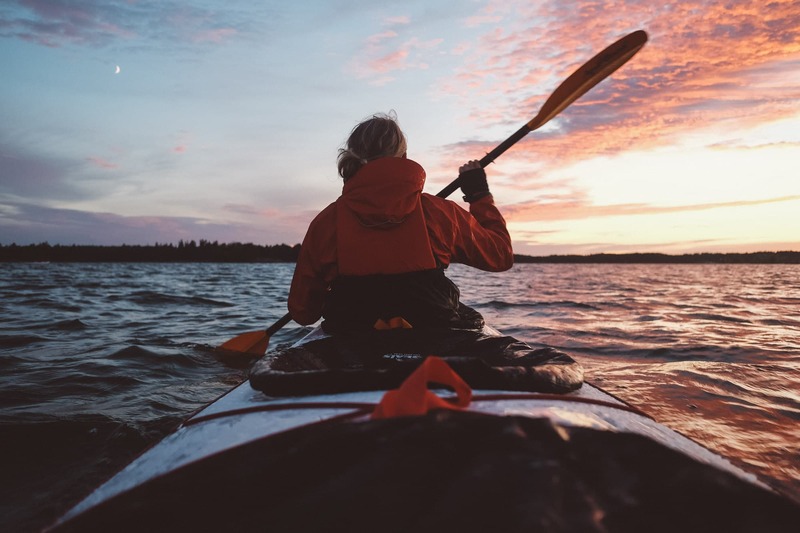 Regarding alcohol, boxed wines, as well as cans of beer are easy to stow in the kayaks, much preferable to glass bottles of wine. There are several places to dispose of rubbish in the archipelago. We provide 9 liters of fresh water per person in Klean Kanteen drinking bottles and water canteens. There are a few places to replenish your water supply along the way. Be sure to go to the herbs, spice and condiments section of the food order. You can select as many as you like at no extra charge. We’ll provide a versatile set of cooking supplies – wooden spoons, ladles, mixing bowls, whisk, etc. If you’re a keen cook, you’ll be well equipped! All the recipes colour coded to indicate durability recommendations. Note! these recommendations are adapted to the cooler bag that fits in our double kayaks. If your group is using single kayaks only, please consider the red category to last 1 night, and the orange and purple category to last 2 nights instead. Red: will last maximum 1 or 2 nights. Fresh meat, chicken and frozen fish – 1 night. Frozen chicken, fresh milk, cream, yoghurt, sour cream, smoked salmon, ready-made creamy salads like potato salad, shrimp salad – 2 nights. Orange: will last 3 nights. Meatballs, smoked ham, smoked turkey, roast beef. Soft and hard cheese. Perishable vegetables like spinach, arugula, lettuce, mushrooms, scallions, fresh herbs, cherry tomatoes. Swedish style wraps. Purple: will last 4 nights. Butter, creme fraiche, halloumi, parmesan. Hummus. Bacon, sliced salami, prosciutto, sausages like chorizo and brats. Cucumber, peppers, tomatoes, zucchini, aubergine. Blue: will normally last your whole trip. Root vegetables, onions, cabbage. Eggs, long-lasting milk & cream. Hard-smoked or cured sausages like whole salami, whole “Onsala” sausage. Lemon, limes. Green: long-lasting. Anything preserved e.g. tuna, anchovy, sardines, mackerel, crab, beans, olives, grilled peppers, pesto, mayonnaise. Tortilla wraps. If you find some recipes you like, order the ingredients in the food order section, print them out and bring with you when paddling. There are also a few typical Swedish dishes. There is a water-side restaurant on Harstena island. Enjoy a lunch of traditional archipelago cuisine and a Swedish lager for lunch! There is also a small kiosk where you can buy ice cream, candy and dried goods. The restaurant and kiosk close at the end of August. You can order a Fishing Kit in the Upgrades section of your Trip Planner. It includes everything you need to go fishing off the rocks. You’re most likely to catch perch or pike, but there are sea trout, salmon and whitefish also. It’s by no means a guarantee to get fish so don’t plan any meals around your catch. Look at it as a fun bonus meal or appetizer.